Real organic white cheddar cheese between organic buttery tasting rich crackers. USDA Organic. While carefree mid-summer days inspired our name, the love of family inspired our ideas. On any given day you can find three generations at work including my father and cofounder, mother, husband, aunt and three year old son, the boy on the front and the biggest fan of our new organic mini sandwich crackers. As a mother, I'm constantly in the position where I need to give my son a snack on the go, but I'm not willing to sacrifice the quality of the ingredients for convenience. These mini sandwich crackers were developed with him in mind. Our family hopes you enjoy them. 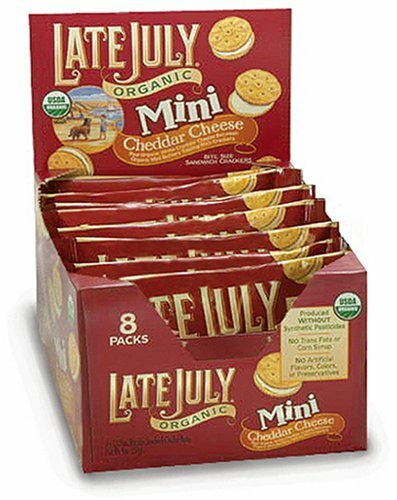 The organic ingredients in our Mini Cheddar Cheese Sandwich Crackers are produced without synthetic pesticides, chemical fertilizers, genetic engineering, antibiotics or added growth hormones. They also contain real organic cheddar cheese, no trans fat, no hydrogenated oils, no corn syrup, no artificial flavors, no artificial colors, no preservatives, and are lacto (dairy) vegetarian. Why choose our organic snack? Because while it's popular now to make products with all natural ingredients, in the 25 years our family has been making snack foods, we've always used them and always will. And with our new company, Late July Organic Snacks, we've taken that dedication to a higher level by using organic ingredients. We are independently owned, family operated and all our products are certified USDA Organic. Certified organic by Quality Assurance International. Light and buttery crackers meet processed cheese filling. I bought these for my 18 month old twins for easily portable snacks. The package is the perfect size for them to share at snack time. The individual pouches make it easy for me to grab a healthy snack to go. My daughters love them and I like them. The crackers are to die for. They are the lightest and the most buttery crackers I have every had. I plan on buying their plain crackers as well. An excellent healthy choice for snacking! Each box has 8 packages; each package is about 130 calories. They are slightly larger than most of the 100 calorie packs available now, and I find them equally filling. The portion size is more than adequate for a snack. They actually taste better than Ritz Bits, which I still like, but now I prefer these. The price here is similar to what I pay at a local grocery store, but sometimes they are limited in quantity at the store. Compared to some of the natural markets (Wild Oats, Whole Foods, etc) the pricing here is about half the cost. Well worth the purchase if you like a good cheese & cracker snack in a "metered" portion. We were running to the park last night and I stopped in the grocery store for a few snacks to bring along. I bought a 5-oz box of these crackers for $3.99. My son has autism and is *extremely* picky about what he will eat, it is almost impossible to get him to try something new. But I was hoping he'd give these a try. I was amazed that he took a bite of these...and LOVED them! He hate half the box at the park! My 2-year-old and 11-month-old also enjoyed them, and I had to stop myself from stealing the box. I am not a big fan of Ritz bits...I don't like the processed, "fake cheese" taste of them. The cheese on these tastes so much better.